Blossom Farm Sit Me Up Cosy Innovative nest that grows up with your baby. It starts as a soft play mat with Blossom Farm soft animal toys. As your baby grows, it converts into a supportive sofa prop to help them sit up. Do not let your baby or child sleep in this product. As it grows, a child's brain allows hand-to-eye coordination skills to be more and more refined. The more you use these varied skills, the better they get. Toys designed to encourage drawing, colouring, cutting, batting, throwing and catching all boost hand-to-eye coordination. Good hand-to-eye coordination also benefits general physical coordination, balance and confidence. 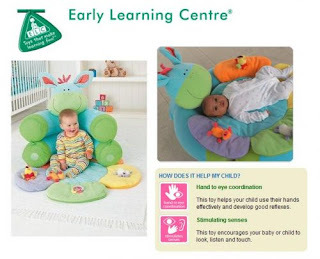 helps your child use their hands effectively and develop good reflexes.